Tourism is alive and well in Napa Valley, reported Napa Valley Destination Council CEO Clay Gregory. Continuing this blog's focus on Tourism Business Improvement Districts the following article on Napa Valley highlights where this approach seems to be working very well, on many levels. Gregory was speaking to more than 160 winery, hotel, restaurant and other visitor-serving business people who attended the Napa Valley Destination Council (NVDC) mid-year update on Thursday. During the afternoon meeting at the Meritage Resort, Gregory and his staff recapped marketing and other efforts from the past six months. Gregory had good news to report. In Napa County, lodging occupancy rose to 67.2 percent, up 7.1 percent when compared to the same 10 months last year, Gregory said. The average daily room rate climbed 7.3 percent to $234.85 over the past 10 months, he said. To compare, the average occupancy in the U.S. for 2011 is forecast at 59.1 percent, an increase of 2.5 percent, Gregory said. Destination Council staff has crisscrossed the country in the name of Napa Valley, attending trade shows, hosting tours, establishing new partnerships and creating new promotions to draw interest to the area. Visitors seem to be finding their way to the area as well. According to the council, 115,489 people have visited the new downtown Welcome Center from April to November. The marketing efforts are made possible by the Napa County Tourism Improvement District (TID) lodging assessment. The TID, created in 2010, imposes a 2 percent assessment on the bill that county visitors pay for lodging. 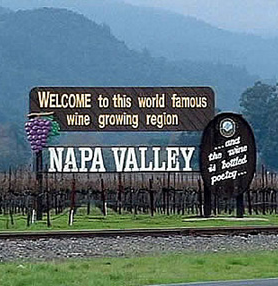 The money is to be used to fund visitor-serving activities and draw tourism to Napa Valley. Using those funds, the NVDC was able to create a $4.3 million marketing budget for the current fiscal year, July 1 through next June. On Thursday, representatives from individual Napa County cities presented their own marketing efforts and some results. Yountville has seen a 19 percent increase in transient occupancy tax from fiscal year 2010 to 2011, said Steve Rogers, town manager. American Canyon has a new slogan: “Discover How Close You Really Are” and is forging new partnerships with the neighboring Carneros region. Chris Canning of Calistoga’s Chamber was delighted to announce that more than 7,000 people attended the city’s annual Lighted Tractor Parade this month. The event received some national media attention and a number of local restaurants set retail records during that event, he noted. Transient occupancy tax is up 11 percent in the northern Napa County city, he noted. “It’s fascinating that there wasn’t anything like this a year ago,” Nancy Bialek, executive director of the Stags Leap District Winegrowers, said after the meeting. She came away with new ideas for more collaboration between the appellation she represents and the town of Yountville. “There seems to be an opportunity to do that,” she said. “The TID gives everybody a feeling of being more connected (rather) than just individual communities,” Darcy Barboza, director of retail operations for Trinchero Family Estates, said. “It brings us all together, and we all benefit,” she said. Steven Sansone of Cosentino Winery said he likes how the NVDC is selling Napa Valley as a whole. With new promotions in different kinds of media from print to online technology, “They’re making it simple for the consumer to get what they want,” he said. “It’s great to see what the other towns are doing,” Andrea DeTrinidad of Mount View Hotel & Spa in Calistoga said. With the TID funds, “Napa Valley is finally able to tell its story,” Beazley said.